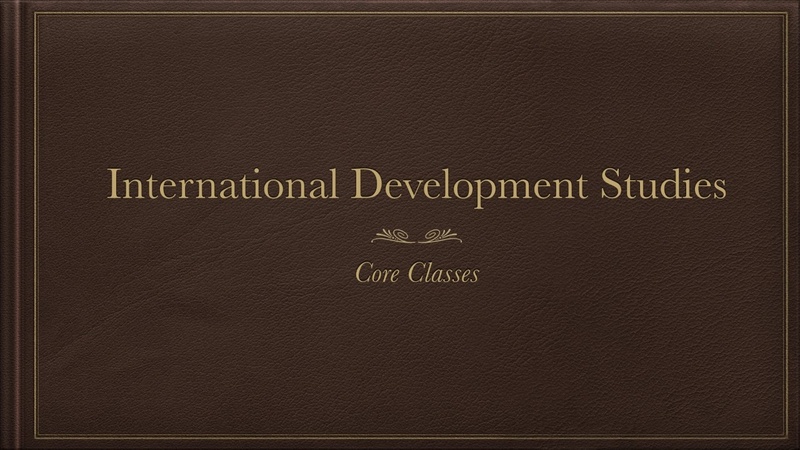 INTD 2001.03: Introduction to Development I. (The Global Development Primer) Poverty, inequality and injustice are widespread throughout the contemporary developing world. This module-based course will examine how this situation came to be, by engaging students directly with the pressing development issues of today. Students learn about the meaning of "development" and then examine the major themes in the discipline through modules that are taught by experts. The Global Development Primer recognizes colonial legacies of development and goes beyond any basic development studies textbook in order to critically engage students with issues that are shaping our world today. INTD 2002.03: Introduction to Development II. This course builds upon the core concepts and approaches studied in INTD 2001 (ie. theoretical approaches to development and the historical creation of underdevelopment). The course examines key contemporary issues in the field of development and analyses the connections between them: debt, global trade rules, foreign aid, hunger and malnutrition, rural and urban livelihoods, population growth. The course also examines the principles actors involved in development and the strategies they have used to promote and resist development, including governments, non-governmental organizations (NGOs), the World Bank and IMF, and popular social movements in the Global South and North. INTD 3002.03: Development Practice. This course is designed for third year undergraduate students who are interested in a career in international development. The course will introduce students to the internal dynamics of development organizations (both governmental and non-governmental), development planning, methodologies of development practice in the field, ethical issues related to development work, fundraising, project proposal writing and project evaluation. The major assignment will involve the preparation of a development project proposal. Because this is a course in development practice, it will involve both seminar discussions and practical 'hands-on' activities. Different sections of the course may include different thematic emphasis - eg. rural development, gender and development and community development. INTD 3003.03: Development and Activism: Methods of Organization, Manifestation and Dissent. There are three prats to this course. In Manifestation, we explore theories of activism to understand how motivated individuals managed to change their societies. In Organization, we wrestle with the legalities of forming a civil-society organization. In Dissent, we take our skills to the streets by organizing lawful protests. INTD 4012.03: Honours Thesis Seminar. The honours thesis course is open to only those students who have been accepted into the thesis stream of the IDS honours program. This course will support students through the writing of their honours theses, from proposals to completion. Issues of research design, method, and ethics will be addressed, and work in progress will be presented. INTD/CANA 1102.03 & 1103.03: Halifax and the World. This course offers an introduction to both International Development Studies and Canadian Studies by exploring the connections between important global issues and your daily life as a student in Halifax. As you walk across the Dalhousie campus and go about daily life in Halifax, your actions connect you to people around the globe and to the history of the city and world as well as to the many works of literature, art and music that depict these connections. INTD 2045.03: Indian Society: Change and Continuity. The objective of this half-credit course is to introduce students to the society and culture of India from an interdisciplinary perspective. India presents a society of enormous complexity and an unbroken living civilization of great antiquity. The focus of the course will be on selected, significant aspects of Indian society with particular emphasis on issues of current relevance. Topics discussed include: a historical background, social structure, political and social constraints to economic development, health issues, major religions and philosophy, development and foreign policy since independence, science and technology, disaster relief and development, and literature. This course counts as a half-credity in Sociology and Anthropology towards the IDS established discipline requirement. INTD 2106.03: Africa: An Introduction. This course will focus on contemporary Africa. Stereotypical protrayals of Africa will be examined and critiqued with the goal of emphasizing the immensity, diversity and complexity of the continent in order to better understand the opportunities and challenges of African development in the twenty-first century. INTD 2201 X/Y.06 / 3201 X/Y.06: International Development Studies through Canada World Youth. This course is intended for Canada World Youth participants who wish to use the Canada World Youth experience as a basis for further study - leading to an academic credit. Canada World Youth registrants will receive detailed written course guidelines and a reading package. CWY participants are required to keep a journal of their observations and to write a research report drawing upon their experience on the CWY project both in Canada and overseas. Upon return to Canada, they should communicate with the International Development Studies Office at Dalhousie and should extra guidelines be sought, they inform the Course Instructor at that point. Normally, within 60 days of their return, they should submit their reports (in accordance with detailed guidelines provided by the Instructor) for evaluation. All CWY course participants are encouraged to present talks to local high schools, youth groups, and appropriate community-university organizations. The degree of analysis will be more demanding the higher the level of course taken. In each case, papers may be written in English or French. INTD 3000.03: Seminar in Development Studies. This seminar course consists of an intensive examination of a selected issue within International Development Studies. Since the specific topic or research problem will vary from year to year, students are advised to consult the department prior to registration. INTD 3001.03: Contemporary Debates in Development Theory. This seminar course examines key contemporary theoretical debates in International Development Studies and their relevance to the real world of development practice. INTD 3010.03: Seminar in Development Studies. This seminar course consists of an intensive examination of a selected issue within International Development Studies. Since the specific topic or research problem will vary from year to year, students are advised to consult the department prior to registration. INTD 3012.03: Sustainability, Development, Economy. This course offers an introduction to principles and equitable distribution of benefits oriented towards issues of economy. The course adopts an interdisciplinary framework of inquiry to explore challenges of appropriate scale (relative to biocapacity), efficient allocation, and inter and intra-generational equity. In addition, the course will consider how these issues apply to managing real world issues in environmental management, and will explore tools to quantify and interpret scale, efficiency, and distributive justice. This course is designed as a one-term introduction to the intersection of sustainability, economic issues and social justice for undergraduate students who have little or no prior exposure to economics, but who have completed one or more courses in international development, ESS, environmental science, or related programs. INTD 3101.03 / 3102.03 / 3202 X/Y.06: Special Topics in International Development Studies. A course on a particular aspect of international development taught by special arrangement between individual IDS major or honours students and individual instructors associated with the program. INTD 3104.03: Seminar in Development Studies. This seminar course consists of an intensive examination of a selected issue within International Development Studies. Since the specific topic or research problem will vary from year to year, students are advised to consult the department prior to registration. INTD 3106.03: Seminar in Development Studies. This seminar course consists of an intensive examination of a selected issue within International Development Studies. Since the specific topic or research problem will vary from year to year, students are advised to consult the department prior to registration. INTD 3107 X/Y.06: Experiential Learning: Canada. Experiential learning is an opportunity for students to engage in the global/local through volunteering and studying. Other programs and departments use such as internship, volunteer or co-op placements. IDS has adopted the term experiential learning because it reflects the interplay between academic and practical skills development that this program offers. Experiential learning courses are available for both local/Canadian and international placements. The Canadian component of experiential learning focuses on the themes of community development and public engagement. The international component addresses questions of global citizenship. The Canadian component of experiential learning combines classroom learning with volunteer work experience in a community organization in Halifax or other parts of Canada. Students are required to volunteer for a minimum of 60 hours over the Fall and Winter terms, or approximately 3 hours/week. In addition to this work, students are required to attend regular seminar meetings and complete three academic assignments (a mid-term report, a reflective paper and an academic paper). INTD 3109.03: Experiential Learning: Abroad. The experiential learning abroad course is open to International Development Studies students who wish to obtain academic credit for an overseas placement, volunteer experience or internship. Students who have already secured a place in an overseas experiential learning program can register for this half credit. Special permission to register for this course is required and an application for this course must be completed prior to registration. Students are required to complete course readings and to write several reports reflecting on the relevant literature and the practical work experience. One half credit is completed over the course of a full academic year. INTD 3110.03: Migration and Development. The purpose of this course is to explore and better understand the connections between migration and development in contemporary societies. Classes will introduce or further explore one main theme or issue, such as development-induced displacement, labour migration, and HIV/AIDS and migration. Each class will centre on one or more discussion questions, exchange insights from relevant experiences of class participants or focus on a case study. INTD 3111.03: Popular Culture and Development. Development does not occur in a vacuum; it is informed by a particular cultural understanding and carried out by a specific mode of politics. Similarly, culture too, unlike the common belief, is not an autonomous realm, but consistently shapes and is shaped by other societal dimensions. This course will seek to understand the connections between culture and development by specifically exploring the dynamics of popular culture and its linkages with capitalist forms of development mainly in the South. INTD 3114.03: Environment and Development. This seminar investigates the intersections between environmental science and development studies. Our primary focus will be to understand how the non-human environment impacts and constrains development interventions, both in the past and the present. The course is organized into three distance sections. The first focuses on informal lectures mixed in with discussion and interactive forums, revolves around student presentations, while the final component consists of a simulated negotiation. INTD 3115.03: Global Health: Challenges of Global Health Equity in the 21st Century. By examining global inequities that lead to health injustices, this course explores why healthcare is abundant for some and nonexistent for others. It identifies why some are born to live well, and others are doomed to die quickly. It asks, "what are we going to do about it?" INTD 3116.03: Contemporary Issues in Gender and Development. The course critically examines how development processes affect women and men and gender relations. Many development projects and policies have had a negative impact on women. The course provides a theoretical and conceptual grounding in gender/women and/in development, explores the gendered impact of policies and processes and examines issues such as governance, HIV/AIDS, and conflict. INTD 3125.03: The French-Speaking World. Introduction to the French-speaking world from a political, cultural, social and economic perspective. Study of the organization known as la Francophonie, with an emphasis on its evolution and mandate, as well as on the bliateral and multilateral cooperations between its member countries, the course is designed for students who are not specializing in French. The course format will consist of lectures and in-class discussion of print and audio-visual materials. Student assessment will be based on oral presentations, assignments, exams and written papers. The language of the course will be English. INTD 3150.03: Aspects de la francophonie/Aspects of the Francophone World. Introduction to the study of the francophone world: political, economic, linguistic, literary and cultural aspects. From year to year the course might emphasize different regions: Western countries, Sub-Saharan Africa, Pacific Islands, West Indies, Northern Africa. Taught in French. INTD 3401.03: Seminar in Development Studies. This seminar course consists of an intensive examination of a selected issue within International Development Studies. Since the specific topic or research problem will vary from year to year, students are advised to consult the department prior to registration. INTD 3406.03: Seminar in Development Studies. This seminar course consists of an intensive examination of a selected issue within International Development Studies. Since the specific topic or research problem will vary from year to year, students are advised to consult the department prior to registration. INTD 3408.03: The Cuban Development Model. This course examines the evolution of the Cuban development model, from the Conquest and colonization by the Spanish to the reforms of the early 21st Century. The objective is to develop an understanding of the various development strategies employed by Cuba, particularly since the revolution of 1959. When asked about the Cuban development model, most people nowadays would say "tourism." Thirty years ago is was sugar -- as it had been from the beginning of the 16th Century. In fact, Cuba obtains most of its hard currency from medical-related services -- mainly from the exportation of medical services, but also from the sale of sophisticated biotechnological products. Cuba's approach has evolved dramatically in the last two decades, and particular attention will be paid to this period. INTD 4001.03 / 4002.03 / 4003.06: Special Topics in International Development Studies. INTD 4004.03: Topics in Cuban Development. This course will undertake a careful, in depth examination of a select theme in Cuban development. The theme will vary from year to year. These may include such topics as: Issues of Gender & Society, Economic Relations & International Policy, Sustainable Development & Social Participation in Rural Communities & Agricultural cooperatives, Family, Poverty, Social Development and Community Programs, Social Class Dymanics and Ecnomic Strategies. The course will be taught in Spanish. Classes will involve the reading, presentation, and discussion of selected readings. INTD 4006.03: Global Poverty and Human Rights: From Development to Global Citizenship. This course explores contemporary debates from an interdisciplinary cadre of scholars in order to understand why our political and financial systems acquiesce to contribute as active participants by generating critical debate out of the assigned readings. INTD 4011.03: Advanced Seminar in Development. INTD 4013.03: Environmental Conflict and Security. This seminar seeks to unravel the origins of conflict in the Global South. It emphasizes the ecological dimension of conflict, by investigating the intersections between natural resources and political upheaval. We will trace the origins of a diverse set of conflicts evaluating the role the non-human environment play sin triggering upheaval, as well as possible steps to alleviate ongoing conflicts and prevent new ones. INTD 4022.03: Advanced Seminar in Development Theory. INTD 4100.06: Special Topics in IDS. INTD 4211.03: Gender and Development: Theory, Concepts and Methods. The primary aim of this course is to provide a broad foundation to some of the theoretical perspectives which ahve informed current thinking in gender and development. The course introduces students to key concepts in the analysis. INTD 3301.03: Spanish Language and Grammar: The Cuban Dialect. INTD 3302.03: Social Development in Cuba. This course examines the situation of women, the family and children in Cuba, and the eduational system in theory and in practice. INTD 3303.03: The Political Economy of Cuba. Analysis and debate of the forms of politics practiced in the Cuba revolution, as well as State institutions, during the various stages of the revolutionary process. Study of the evolution of the Cuban economy and all its principle strategies, including the economic crisis and Cuba's reinsertion in the international economic arena. INTD 3304.03: Sustainable Development in Cuba. The course examines Cuba's experience with sustainable development, including recently introduced agricultural cooperatives and communal environmental education. INTD 3306.06: Field Research Practicum. This course involves four weeks of field research under the supervision of a Cuba professor, culminating the producation of a major research paper. Research will be undertaken in one of the following three areas: a) the environment and sustainable development; b) women, family and childhood in the community; c) community work and social participation. INTD 3310.06: Cuban Culture and Society. Through seminars, lectures and other activities, students will be introduced to Cuban society and culture. This course consists of briefing and debriefing sessions in Halifax and with two weeks spent in Cuba. In Cuba, there will be daily lectures in English at the University of Havana and field visits to sites in and around Havana with opportunities to meet and interact with the local population. Participants will be required to keep a journal, and prepare and present a research paper on an approved topic related dto Cuban development. This course countsn as a credit in IDS, or Spanish towards the IDS established discipline requirement.